Beige cow grain leather riggers gloves – Large. 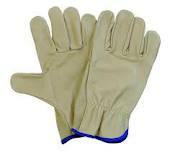 These industrial leather work gloves are ideal for use as gardening gloves, work safety gloves, protective gloves, rigger gloves, builders gloves or as any other industrial work glove. Provides dexterity and protection against abrasions.